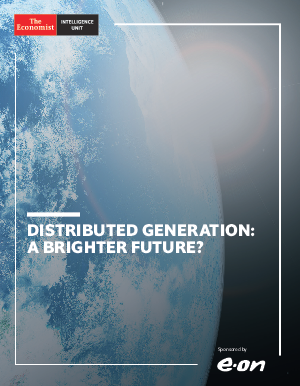 > Research Library > E.ON > Distributed Generation: A Brighter Future? Distributed generation: a brighter future? is an Economist Intelligence Unit report, sponsored by E.ON. In this paper, we examine the growth in distributed generation, as an increasing number of UK businesses are meeting a greater proportion of their energy needs through electricity generated themselves, on-site. This report seeks to examine the impact that distributed generation could have on UK businesses. Download today to find out more!